Join us for an extensive campus tour! Choose one of three convenient weekday times or visit on a Saturday. Our preview days are your best chance to tour, learn about programs and meet our campus community. Can’t get to Monmouth? Watch our video tour! You’d be able to picture yourself becoming part of the WOU family. We love visitors at WOU, so we make parking simple! There are more than a dozen lots throughout campus for you to use, and free guest parking passes are available from every department/organization. You can arrange parking in advance, or just drop in and pick up a pass. Either way, we’re happy to have you on campus. Extend your visit to WOU by checking out one of our many campus events. On any given day, you’ll find art exhibitions, student performances, sports events, club events and displays at the library, all of which are open to the public. It just goes to show you that there’s plenty to do at WOU! 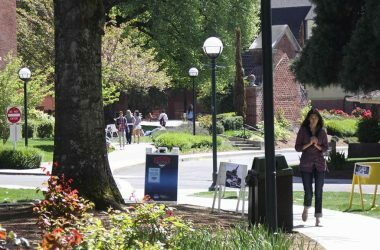 Students who visit WOU, apply for admission, and submit their transcript(s) on a Friday can receive and admissions decision before they leave campus. Upon request, we have great students fluent in Spanish and American Sign Language ready to take you on a tour. Please allow 2-3 weeks for scheduling. 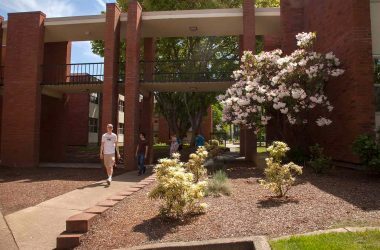 Overnight stays in on-campus residence halls can be arranged by contacting Trina at horseyt@wou.edu. Or stay close by in an Airbnb or hotel!